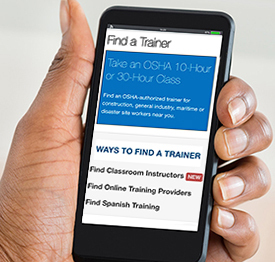 OSHA’s website now has a searchable list of authorized Outreach trainers to assist the public in finding authorized instructors for the 10- and 30-hour Outreach classes. The list provides trainer names and contact information, and indicates which course the trainer is authorized to teach (construction, general industry, maritime, or disaster site worker classes). OSHA expects the list to grow as more Outreach trainers are added. If you are a trainer who is interested in having your information listed, contact your Authorizing Training Organization. Oregon OSHA issued $45,064 in penalties and 11 citations to Pacific Coast Seafood in Warrenton for exposing workers to fall and electrical contact hazards. Inspectors determined that the company failed to: put a cover plate on a live 110-volt switch; guard rotating fan blades and other moving mechanical parts; lock out machines during servicing; and exposed workers to fall hazards. Michigan OSHA issued three citations and $147,000 in penalties to RSB Construction Services LLC, in Goodrich, for failing to train workers on fall hazards, and provide required guardrail, safety net, or personal fall arrest systems for workers on a pitched metal roof. OSHA has ordered JetBlue Corp. to reinstate and compensate a flight attendant who was fired for raising safety concerns about a flight. After a passenger aboard the plane remarked about a perceived safety violation, the attendant exited the plane onto the jetway to contact a supervisor for guidance on addressing the safety concern. JetBlue fired the attendant in part, for stepping off the plane, and making the call from the jetway. 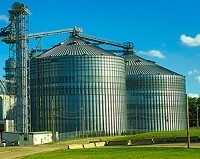 OSHA concluded that the attendant’s protected whistleblower activity was a contributing factor in the termination. The order requires JetBlue Corporation to clear the affected personnel file and pay $143,783.66 in back pay, compensatory damages, and attorneys’ fees, and post a notice informing all employees of their whistleblower protections. For details, read the news release. Following the devastation inflicted on the U.S. Virgin Islands by Hurricanes Irma and Maria last September, the territory’s On-Site Consultation Program, Safety in Paradise (SIP), could not perform normal consultation services for months. SIP consultants went to affected worksites and spoke with employers and their employees, provided safety and health assistance, and helped identify and address hazards. During the recovery period, consultants assisted more than 50 businesses, reached more than 600 employees, and removed approximately 150 employees from hazardous situations. 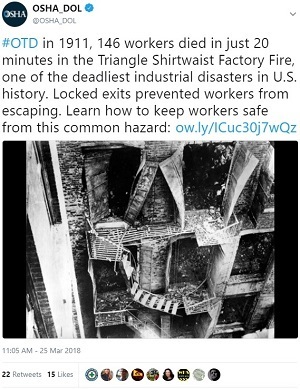 Visit OSHA’s website for more information. BAE Systems Norfolk Ship Repair facility in Virginia earned OSHA’s Voluntary Protection Programs’ (VPP) Star designation for exemplary commitment to workplace safety and health. 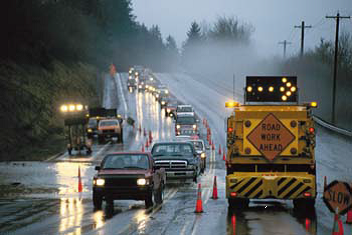 VPP recognizes employers and workers who have implemented effective safety and health programs, and maintain injury and illness rates at or below national averages for their respective industries. The facility’s injury and illness rate was 60 percent below the national average, and its rate of incidents resulting in lost work days was 56 percent below the industry average. For more information, read the news release. OSHA's Strategic Partnership Program provides opportunities for OSHA to partner with employers, workers, professional or trade associations, labor organizations, and other interested stakeholders. Strategic Partnerships are designed to eliminate serious hazards and enhance workplace safety and health practices in major corporations, government agencies, private sector industries, and at large construction projects. OSHA and the J.E. Dunn Construction Company entered into a partnership to protect 400 workers during the construction at a senior living facility in Austin. The two-year partnership will focus on effective safety and health programs, and controlling hazards associated with trenching, cranes, falls, and being struck by moving equipment. OSHA and the McCarthy Building Companies are partnering to help protect employees working on a hospital construction project in Corpus Christi. The three-year partnership will focus on fall, struck-by, caught-in or -between, and electrocution hazards, and will educate employers and employees on best practices, and improving safety and health programs. The Associated General Contractors - Panhandle of Texas Chapter renewed a three-year agreement to focus on falls, electrocution, struck-by, caught-in or -between, and heat illness hazards. The Northwest Arkansas Worker Justice Center renewed a three-year agreement to reduce and prevent exposure to struck-by, fall, ergonomic, and electrical hazards in the residential construction and poultry industries. Start fresh this spring by using OSHA resources to make a clean sweep of hazards that can cause injuries and illnesses. Join a free webinar, “Three Core Elements of Effective Safety and Health Programs,” on April 25 to get ideas about showing management leadership, encouraging worker participation, and finding and fixing hazards in your workplace. Use our new fact sheet, Walk-Arounds for Safety Officers to guide your efforts to find and fix hazards. Visit our website for more information on safety and health programs. 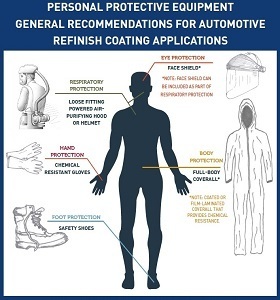 Through its Alliance with OSHA, the American Chemistry Council developed an infographic that provides personal protective equipment (PPE) recommendations for the automotive refinish market. The infographic provides general information on the importance of PPE during the refinishing process. High performance polyurethane coatings used in automotive refinishing applications, can present health hazards from skin contact or breathing in vapors, if appropriate PPE is not used during the painting process. 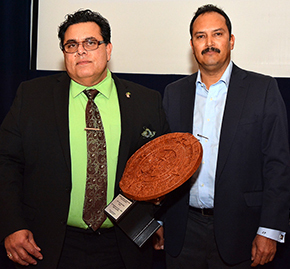 Basil Singh (left) accepts the RHCA's John Kelly Safety Award on behalf of OSHA's Dallas Area Office. OSHA’s Dallas Area Office received the 2017 John Kelly Safety Award from the Regional Hispanic Contractors Association (RHCA), for its work and collaboration with the RHCA to encourage contractors to develop safety and health programs to prevent worker injuries and illnesses. The Dallas office and the RHCA have been in an Alliance since 2014; which has resulted in the sharing of resources, collaborating during RHCA Safety Committees, OSHA 10-hour Construction Safety Courses, and the monitoring of Susan B. Harwood Grant program free construction safety training. After 45 years in Bellevue, Wash., federal OSHA’s area office has moved to Seattle, and will now be known as the Washington Area Office. The office is at 300 Fifth Avenue, Suite 1260, Seattle, WA 98104. The phone number is 206-757-6677. QuickTakes is emailed free twice monthly to more than 210,000 subscribers. You can receive it faster and easier by subscribing to the RSS feed that delivers almost instant information. Visit OSHA's RSS Feeds webpage to subscribe.